I have seen some of you show up with planes and drones that your wife bought you for Valentine’s Day, BRAVO! It’s nice to see you getting that kind of support for your hobby. Last month I mentioned how nice it was to be getting some rain. This month I am going to borrow (almost) a quote from Patrick Swayze : “ It’s nice, until it’s time to not be nice…” I think we have only had 3 dry weekends since the beginning of December, and I am starting to miss the drought! While on the subject of missed weekends, we lost a few events this month because the field was muddy. For scored events we skipped the monthly wing races and electroglide. Since no one earned points it should not affect our year end tallies. We also lost our last full FPV race practice day with the field fully set up. Next month FPV counts for totals so practice as you can. Lastly we had to give up our EMAC Starter event and Trim Clinic. We are going to schedule a make-up day for this one as I feel it is critical to get this started. Thanks again to Steve Belknap for stepping up to get this arranged and getting the right people to volunteer ( or was it voluntold? ) to discuss proper plane setup and trimming techniques, and then provide pattern demonstrations. The new date for this is Sunday, March 5th starting around 10 A.M. The field will not be closed, but I ask members not participating to be mindful of what is happening at gates 5 and 6 and give them the courtesy I have come to expect. No buzzing the expensive airplanes Skip!! Also, still on the subject of wetness ( Hush Dave G! ), the field weed growth has exploded. Thank you to Dennis Laberge for the numerous hours spent with a hoe removing encroachment from the field proper. The outlying field also has more green than I have seen in a long time. Please be careful out there as now it’s almost impossible to see the rabbit holes and rocks. Walk carefully and protect those ankles. This much growth will inevitably result in a lot of dry kindling in a couple of months. During the March meeting the board will disburse 15 – 20 fire extinguishers to new members that are maintaining a solid presence at the field. This will be the 5th year we have had this practice and it still warms my heart to see people walking out to crashes with extinguishers. Remember though, the club will provide one, but if you use it, we want you to replace it so you always have one with you. I am sure Randy will chime in, but I want to touch a bit on safety. A couple of people received prop bites this month. Please, if you are working on your electronics on the table – and not immediately going to a gate to fly, take a few minutes and remove the prop. On that note, those of you that come with first aid kits should take a quick look and see that they are all good. I bring two, just in case. Jim sent a blast out, but I would like to elaborate on proper LiPo battery disposal. The orange sand buckets are for either dumping sand on a burning model, or a temporary holding area for a damaged battery so you do not have a problem at your table or under your hood. When you leave you are expected to take the damaged batteries with you in either a LiPo Sack or ammo can. If you just dump 15 – 20 batteries in the bucket and leave them, there is no recourse for someone with an actual problem. The best way to dispose of old batteries is to completely discharge either by adding a load using some 12V auto bulbs – 1 bulb for 3S, 2 bulbs in series for 4, 5, and 6S, or use one of the voltage checkers ( ask Randy ) that drain your battery to zero if left for a few days. I have an old BBQ that I set them in for discharging. Once at zero, cut off the connector, strip the leads and twist them together. They are now inert and can go in the trash. Membership is continuing at a decent rate, there are still quite a few people showing up without 2017 badges though. Please get it done, there is nothing to gain from holding out, we are year to year and membership expires in December whether you pay for it now, or thing you are being “ thrifty “ waiting until June… It is disappointing to be asked to leave without flying because you have not renewed. Remember, guest privileges are for AMA members using our site for the first time ( up to 3 visits ) and are not for use by past members. I have been handling the hot dogs on meeting days for just over 4 years. Thanks to Dennis Benitez who will be taking over from me after this month’s meeting. Things may change a bit as we pretty much decide what we want to bring, but in its base form there will be beef hot dogs, chips, and beverages. Periodically I will bring a pot of Chili as I know how many of you like it. Thanks Dennis!! 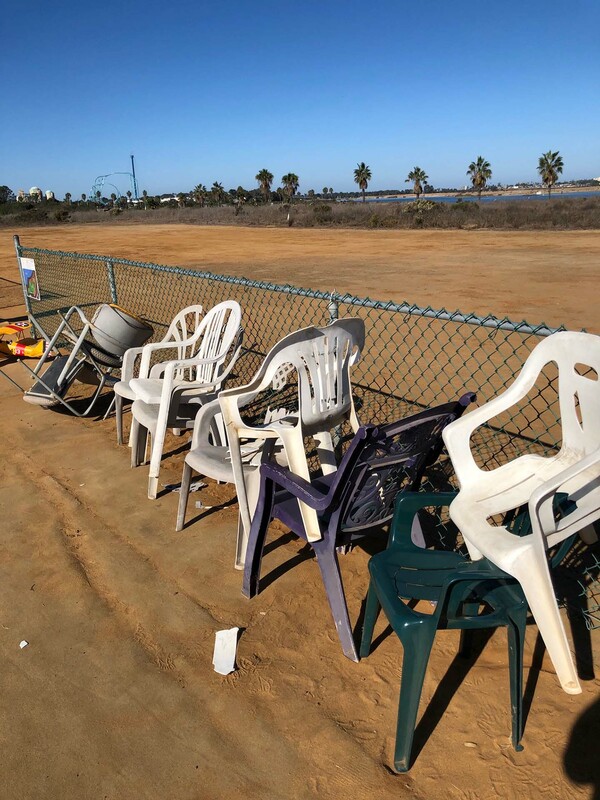 It’s that time again to call out for people that are replacing their patio furniture to bring their old chairs down to the field. We lost some to the recent winds and have had quite a few broken ones lately. This month’s fun fly event will be the Don’t Spill the Beans between 10 and 12 on the 25th. If you have a plane that can fly stable at a moderate speed and lands softly, you have a chance to bring home CASH!!. You will place a supplied container with 20 beans on your plane, take off, fly above 100 feet, pull a loop, then land as softly as you can. He with the most beans wins a share of $150.00 worth of gift certificates from Discount Hobby Warehouse. The monthly club meeting will follow, and we will return to open flying while enjoying the hot dog lunch provided by the Board of Directors. I hope you are having a great month! As we finish out April, I would like to make a few comments related to safe use of our site. First, most of you have noticed the amount of new growth at our site due to the wet start to the year. In some places it is over 8 feet! This raises a few concerns. For those of you (like me) who suffer from pollen allergies, be sure to use your medication of choice before you head for the field, sneezing and watery eyes do not make you a successful pilot! Next, there has been a plethora of people coming off of the street to take pictures of the pretty flowers (weeds). People are all over the place, and we need to avoid flying over them with planes, or ‘taking a closer look’ with multi-rotors. Please give them the courtesy of safety. Also, all of this growth is going to raise our fire risk greatly. Last weekend I saw a couple of people grab extinguishers and run to a smoking aircraft. That is the response we need as we move into the summer. Thank you all for being vigilant! Next, I need to touch on full scale aircraft in our vicinity. Under NO circumstances do we have the right of way when full scale are overhead. Yes, I understand they are not supposed to be below 500 feet. However, they are sometimes vectored through at 300 or 400 feet due to other concerns. We were reported to the tower at least twice this month, and need to get this under control. Please get to 50 feet or below any time there are full scale around. If you are practicing for an event that requires you to momentarily go above 400 feet, like electroglide or the F5 competitions, please ask someone to spot for you so you have another set of eyes looking out for issues. Finally, take a few minutes to review and replace items as necessary in your first aid kits. We hope to never need them, but there are some items that expire. I ended up having to replace a large number of band aids that just wouldn’t stick due to age. Membership is proceeding at a decent pace. We are a bit behind last year’s numbers, currently at 336 members. Not a surprise that things are a bit slow, we are not hosting drone day this year, so some of that member base did not show up. Keep looking for folks flying without a badge and encourage them to join the club. Remember that no one is allowed to fly at our site without AMA, and potential members (not prior members) are allowed 3 guest days with AMA before we require them to join the club. I am still getting a lot of prior members asking for keys to the gate. We have NOT changed the lock, so you do not need a new key every year. From this month forward, keys will cost $2.00 unless you are a new member. Along with the privilege of having a key goes the responsibility to close the gate if you are the last one out. Almost every night this month the gate has been left open with no one around. This leaves us open to all sorts of bad things. PLEASE lock the gate! Our fun fly on the 22nd will be altitude quest. A fun event that only requires you to fly to your designated altitude and land. $150.00 in gift certificates from Discount hobbies will be divided amongst the 5 pilots closest to their mark. This will be followed by lunch and a brief club meeting. Being discussed will be some fundraising ideas for the 4th of July event at the field. Without drone day, we are way behind where we were last year fund wise, and need to generate revenue to support our end of year banquet. It you have ideas – please share! The pics this month are a few of the big Waco I picked up at Don Rice’s estate sale and had the honor of finishing. I am using one of Steve Neu’s new large outrunners, which pretty much prove the fact that there isn’t any plane that cannot be converted to electric power. At 54 (ish) pounds, it is the heaviest plane ever to fly from our field. I hope mid-summer is meeting your expectations. 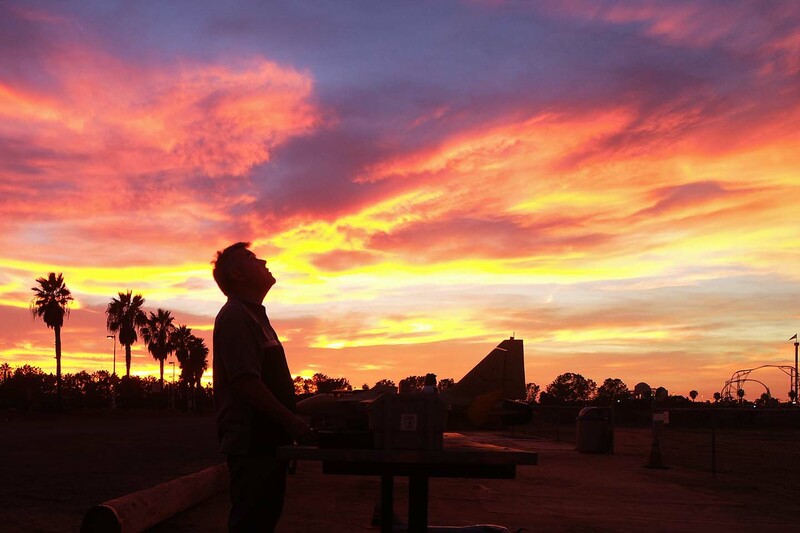 If your expectations have included heat, humidity, and crosswinds – it has been a spectacular month! Well, we knew it was coming, so all we can do is smile and wave. Some of us have been hiding in our air conditioned spaces, but I would like to throw a shout out to Tom, Tuan, and Brian who have been determinedly raising their proficiency in crosswind landings. Great job guys! Jim has been spraying the field to keep weeds down lately, Thank you for not trying to get extra points by seeing how close you can get to him ( Skip!! ) while he is around the edge of the runway. Thanks also to Dennis for countless hours weed whacking, and Tom and Chief for keeping growth down around the tables. 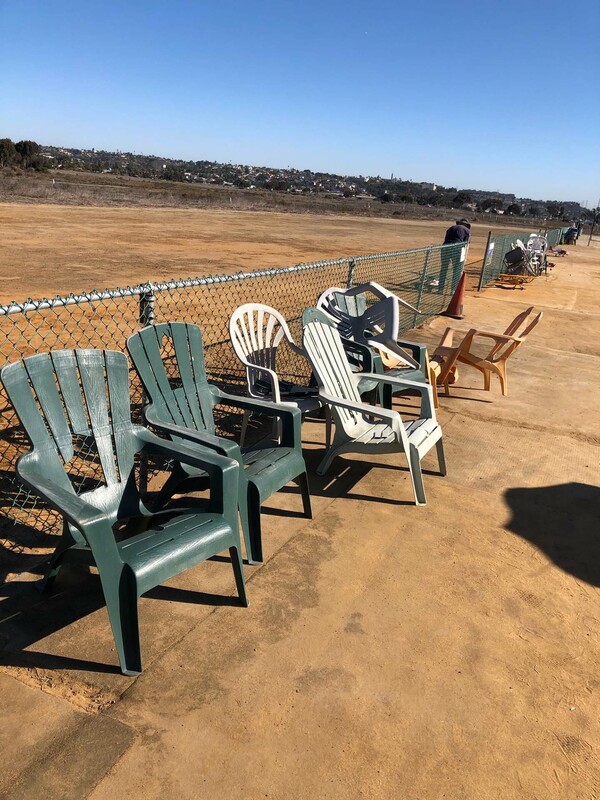 We have had a couple years of use from the tables at the main runway, and we know they are starting to wear. Between now and the end of the year we will change out the worst of the tables to something closer to what was installed at the rotorplex last year. Please do not hurry the demise of the current tables by picking holes into them or striking them with hammers. As a group comprised mostly of grown-ups, I have to ask you all to take the initiative if you see something unsafe. You do not have to wait to tell a board member, or wait for someone to handle it. Please step up and say something, if you need back-up – ask another member to join you and you can both have the discussion. Jim and I saw some VERY unsafe actions at the rotorplex a few weeks back, and both approached from different directions to have a few words. I am positive we would have had the same response if we were not on the BOD. Please join us in keeping everyone safe! We had a pretty decent showing for the festivities on the 4th, the evening cooled off nicely and some of the fireworks were visible this year through the smoke which plagued us the last couple of years by drifting right at us. Thank you to the folks that stayed into the evening for not leaving piles of trash in the pit area. My last conversation with Isabel puts us around 360 members for 2017. A bit behind last year, but still growing. Thanks to everyone that has been stepping up to invite new people to join the club. Steve, Randy, and Fred have been going out of their way to answer questions. The monthly meeting/fun fly/lunch on SEFSD is coming up on 7/22. This is our summer bomb drop event and is a lot of fun, which can be had by all levels of flyers. If you can take off, go to an approximate minimum altitude, and make an approach, you can play! And win prizes! But don’t forget to watch your plane!! When we do the summer bomb drop, we change up lunch a bit by ordering a couple of large subway sandwiches, which will be served by Jim and his wonderful wife Julie. Bring brooms on Saturday. Most of you have noticed that the heat has not been friendly to the field. The clay has powdered in places and is mixed with sand. Before kicking off the fun fly event I would ask that folks bring a broom and we will spend 20-30 minutes sweeping the runway in preparation of Jim doing a 2 day mid-week dousing and rolling of the field. We want to get water down deep so the surface should last the remainder of the year. When Jim puts down the water, we will close the main runway to flying for 2 days so no one puts foot prints on it before it is dry. See you Saturday and have fun!! Finally, it has cooled off a bit! It is crazy that we had to wait until November to get a break this year. Still waiting for some rain to smooth the field out and reduce the risk of fire at our site. We really haven’t had many fires this year, and I want to thank all of you for being careful and having your extinguishers ready as needed. Jim and Dennis have started replacing the worst of the tables at the main runway. Please throw them a thank you for giving up a few flying days to work for us instead. They started with the worst four and will continue into next year as the existing tables give out. Not bad, we have nearly 4 years on tables we expected to last one. A reminder on etiquette at the field, safety concerns, and just plain common sense: In the last 2 weeks I have observed folks walking out past the fence without letting other pilots know they were stepping out. Please call loudly, there were a few VERY near misses! Also, please look and verify no one is on approach before loudly announcing take-off and landing. Also judge the point at which you call your landings, calling too early can leave others stranded with low batteries waiting for a landing that should have been called thirty seconds later. Finally, after landing, if you taxi – please do so near the fence to reduce risk of others coming in after you. As I look over the newsletter for the last few months, I notice a great amount of content provided by members. Thank all of you that have hopped on board! Steve Belknap has been doing a great job of putting it all together for us, and it makes his life a bit easier if he does not have to search for all of the content himself. If you have a neat project, please share! The Board has voted on and approved a small increase in membership dues starting 2018. Dues will go up to $50.00 a year when we start accepting 2018 applications next month. The club costs have been going up over the last few years and this will allow us to keep even. One exciting thing you will see next year is a new style of badge we will be issuing to take some of the load from the membership coordinator – THANKS GEORGE SULLIVAN! We failed to realize how much of a load we had put on Isabel as we took the club from two hundred to four hundred members. Thanks again to Paul and Isabel Guidice for the service to the club for the last seven years. Please join us on Saturday for the meeting and vote. If you want to give back to the hobby you enjoy, I greatly encourage each of you to spend a bit of time on the board so we can all benefit from your ideas and experiences.